We’re still not entirely certain what went down at Trump’s press conference yesterday, or why he thought he could handle a room full of reporters asking intelligent questions on his own. (We’re pretty sure we get why he felt it appropriate to ask for ”nice” questions, and to ask a black reporter about her “friends” at the Congressional Black Caucus.) Even watching the thing play out in friendly, Jimmy Fallon-form won’t shed much light on the matter, because it’s nearly impossible to distinguish which ramblings are fake and which are presidential quotes that might end up in history books. That is, if Education Secretary Betsy DeVos doesn’t sacrifice the subject of history to protect the little children from bears or whatever. 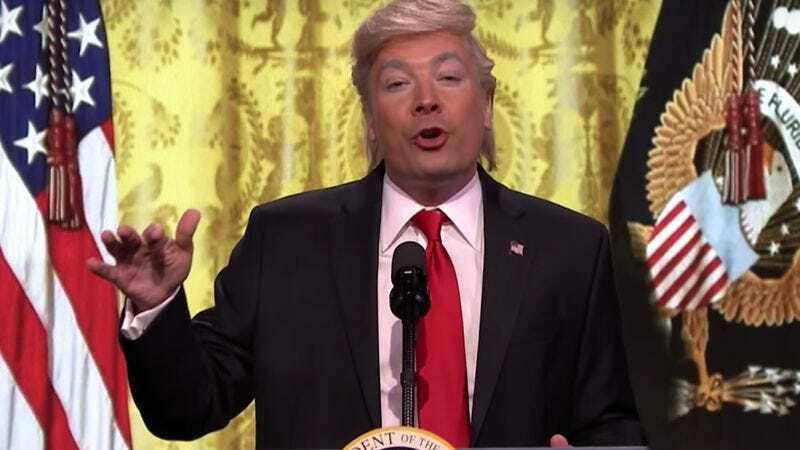 When Fallon slapped on some self-tanner and hay to play president once more, he could have stood up on his soundstage scatting jazz and it would have made as much sense as Trump’s reasoning that he can’t be all that bad if he gets good ratings. We’d say that Trump jokes have become fish in a barrel if he hadn’t also boasted that his nuclear holocaust would be the biggest. That’s just terrifying.